Each boxe contains 15 packs. Each pack contains 6 cards. 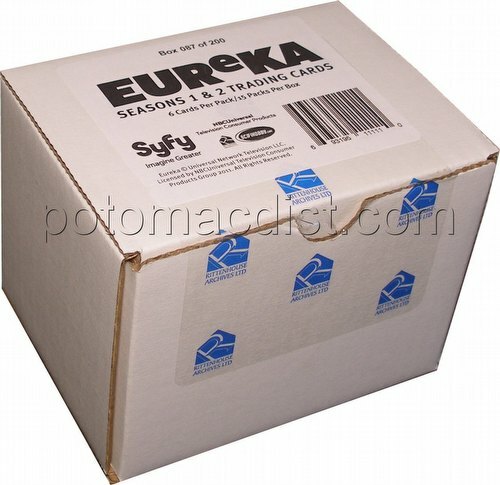 Each Eureka Seasons One and Two Premium Pack box contains 15 packs. Every pack contains 2 Autograph cards, 1 Artifact Relic card, 2 Episode cards, and 1 Casting Call card! Signers include Colin Ferguson (Sheriff Jack Carter), Erica Cerra (Deputy Jo Lupo), Neil Grayston (Fargo), Joe Morton (Henry), Matt Frewer (Taggart), Chris Gauthier (Vincent), Niall Matter (Zane), and more! There are 25 Episode cards (#'d to 250), 11 Casting Call cards, featuring all of the show's top stars (#'d to 350), and 9 Artifact Relic cards, featuring costumes and props (#'d to 350). Only 200 boxes produced!